How Much Money Will I Receive If I Win My Disability Claim? The answer to this question depends on many factors – most importantly, it depends on how much you paid in Social Security taxes on your earnings over your career. The best place to find an estimate of your monthly benefit would be to download your personal Social Security Statement. You may recognize the form on the right as the green form you used to get in the mail every year around your birthday from the Social Security Administration. You have not received this the last couple of years because of budget cuts. It cost the SSA lots of money to print and mail the forms. 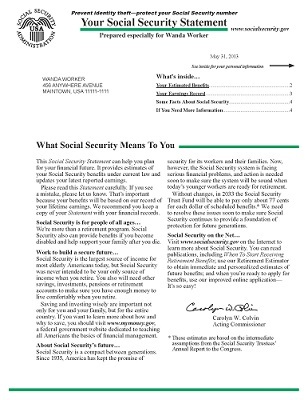 However, now you can go to the SSA website and download a copy of Your Social Security Statement. Follow the steps to verify your identity and create an account. Once you have verified your identity, you will be given the opportunity to download your Statement. The second page of the form has a line that tells you how much you would receive if you are found disabled and how you are eligible to receive in retirement per month.